Advertisers know that the automotive market can be highly saturated and competitive. It is now more important than ever to provide consumers who are looking to purchase their next vehicle with unique and memorable experiences. So how can auto brands deliver high impact messages that connect with customers on an emotional level? 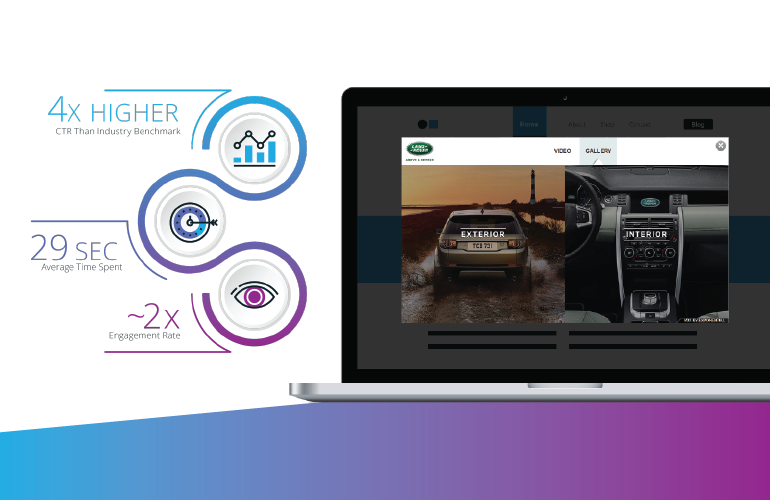 Exponential worked with Land Rover to showcase their Discovery Sport SUV model through an engaging video-driven solution. Check out the case study to discover how the campaign garnered a post expansion CTR four times higher than the industry benchmark, and an average time spent per user that was almost double the benchmark. For more information on how Exponential can drive results for your next campaign, contact us here.